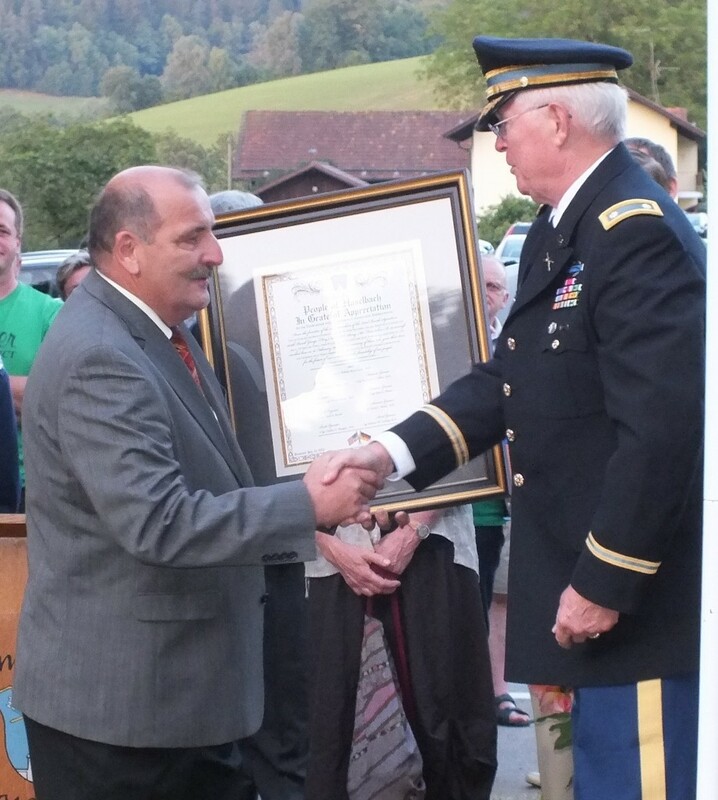 HASELBACH, Germany -- When U.S. Air Force Col. Tracy L. Popey and her family purchased their vacation home in the Bavarian village of Haselbach, they had no idea of the property's history. On Feb. 16, 1945, a B-24 Liberator bomber crashed here, killing seven of the nine crew members. 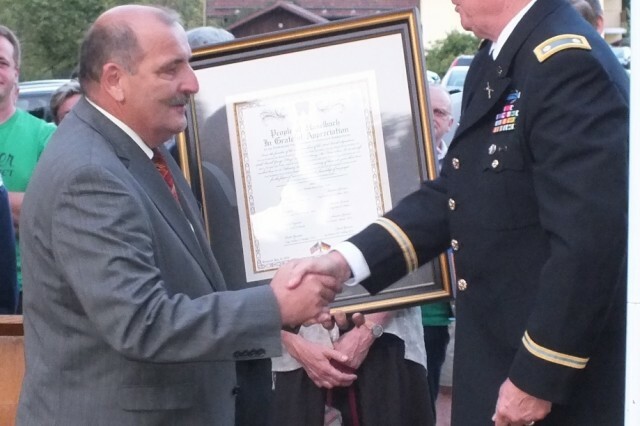 Now, 68 years later, Haselbach paid tribute to the U.S. 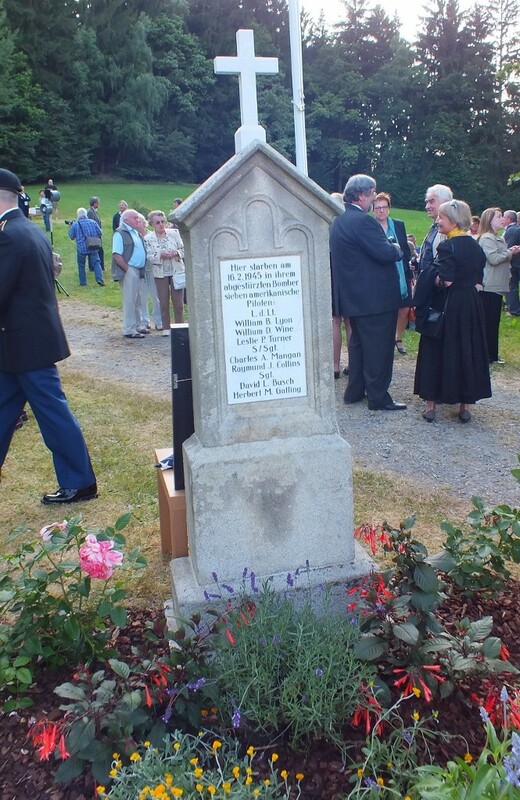 Soldiers who lost their lives in the crash, dedicating a memorial on the property in a ceremony that brought eyewitnesses and surviving family members together, July 13. Thirteen-year-old Alfons Deser was riding his bike nearby when the plane went down. He was the first person to reach the crash site, said Johann Sykora, mayor of Haselbach. "It never went out of his head that seven Americans died here, and he wanted to do something," said Sykora. "He (Deser) said that even though they had been enemies, they were still comrades in arms, and he wanted to honor them," added Popey. Deser, now an 81-year-old stone mason, and his brother Leopold, donated their skills, time and materials to create the monument that bears the names of the seven men who died in the crash. 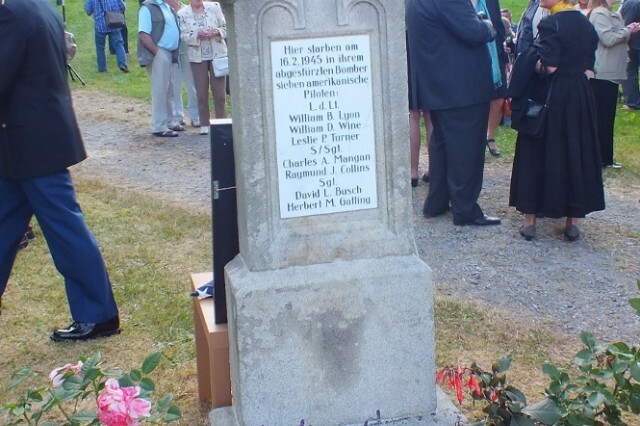 Popey said that the village of Haselbach had wanted to place the memorial on the site for some time, but the previous owners of the property were not interested. "When they realized that Americans owned the property now, they thought maybe they should try again," said Popey, whose family quickly agreed to let the monument be erected on their land. With the information provided through the village, including names of the Soldiers and the date of the crash, Popey was able to obtain the official Army report of the event, which eventually led to contact with many of the surviving family members of the bomber's crew. Retired Army Lt. Col. Ed Sherwood's uncle, 2nd Lt. Leslie Peyton Turner, served as the navigator on the doomed flight, and Sherwood made the trip from Fayetteville, Ga., to take part in the ceremony. On behalf of the surviving family members, Sherwood presented the village of Haselbach with a certificate of appreciation to honor their "kindness and remembrance." In addition, Sherwood passed on a quilt created by Anne Richmond, the daughter of machine gunner Sgt. Al Honey, who survived the crash. The quilt featured photos of the deceased, as well as letters and remembrances celebrating their lives. "It so exceeded what we thought we'd be doing," Sherwood said. "I thought there'd be a small group, maybe a dozen or so." Instead, the dedication included a color guard from Landstuhl, the U.S. Army Garrison Hohenfels garrison commander and command sergeant major, the local firefighter and police units, an eight-piece band, and dozens of Haselbach citizens, many of them eyewitnesses to the crash. "It's amazing that 68 years later we can find so many people who have a direct connection to the event itself," said Popey. Hearing the firsthand accounts was one of the highlights of the evening for Gerry Brown, whose father, Staff Sgt. Owrie Brown, was the flight engineer and the other survivor. Both survivors were blown from the plane and managed to deploy their parachutes. "My father never talked about the war except in little bursts," Brown said, adding that he spoke to a Haselbach resident who remembered details of Owrie Brown's capture by German troops after the crash. "This is the defining moment of my life," Brown said. Throughout the dedication, the friendship and camaraderie between the Germans and the Americans as they honored fallen warriors together was evident as many were moved to tears. "Over the last few days, I've gotten to talk to a number of older Germans who either took part in the war or were witnesses here," said Popey's husband, Bob. "To them, I think that this event has really been a form of healing." "We are honored that we can have even a small part in bringing it about," he added.